On Tuesday (12 May 2015), I went to the National Gallery to see the Alex Colville exhibition. Well, more specifically, I went to see William Eakin’s part in that exhibition. The idea of having several contemporary artists share their responses to Colville’s work intrigued me, but mostly I have to admit that I was thrilled to have a chance to see Eakin’s work at the National Gallery. I’ve met him a few times, seen a few of his shows, had a conversation with him at his opening at Actual in Winnipeg recently (“Time”–Those watch faces! Wonderful!) and had a chance to pet his gorgeous dog a couple of times. So it’s not like Bill and I are buddies, but he’s an interesting guy who does interesting work and I was super excited to go to the National! Gallery! of Canada! (omg, right?) to see some of his work. The National Gallery is the Big League, and it was with growing anticipation that I passed the big spider out front, bought my ticket, pasted my little sticker to my shirt (“12”), and walked up the ramp to the Colville exhibition. The first thing I noticed when I got in was a huge screen playing the scene from Wes Anderson’s Moonrise Kingdom where Suzy holds the binoculars up to her eyes. I just saw that movie for the first time recently, and it was cool to find out that this scene was a deliberate recreation of Colville’s painting To Prince Edward Island. Stuff like that makes me happy: that layering and doubling-back and referencing. Collage and assemblage, that’s what it’s all about (see, for example, http://everythingisaremix.info/watch-the-series/). 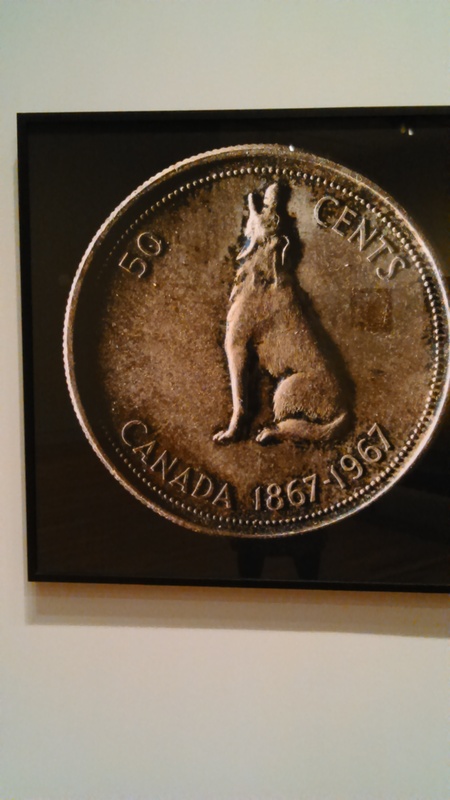 Anyway, then I turned left and saw William Eakin’s photographs of Alex Colville’s centennial coins, and I was delighted. The elements that I loved about the works in “Time” were there (the perfect circles! the marks of history! the fascinating blown-up detail! the ordinary object somehow made mysterious!) but in such a different context with such a different subject. I sat on the bench for a while and looked at them as a whole, and then got close up and personal with each one (sorry, viewers behind me). It was very powerful to me to feel all of the strands and layers to this experience: Eakin’s responding to Colville’s work, the samenesses and differences between this work and other work of Eakin’s that I love, the many hours spent sorting through coins with my dad as a kid and how exciting it always was to come across these centennial ones (especially the bunny), having an acquaintance (however superficial) with the artist, being on vacation at this time and thus in a differently receptive space for new experiences, feeling privy to a conversation between and among artists, and so on. After spending time with Eakin’s work, I moved fairly quickly through the rest of the exhibition. Two other places I stopped for longer were Colville’s war paintings (moved almost to tears by the paintings of Bergen-Belsen, to which I am connected through family history, and of the Nijmegen bridge, which I often crossed when I lived near there), and Tim Hecker’s sound installation. It was fascinating to me how a musician could also formulate a response to a visual artist, and be included in this exhibition. I very much enjoyed listening in that darkened room and feeling the feels. Also, because I wasn’t particularly familiar with Colville’s work before I went to this exhibition, I was surprised and pleased to see how many of his paintings contain dogs. Because dogs, right? I’m glad I went. It was $16 and they didn’t let me take my water bottle in, but the staff were lovely and the washrooms were clean. It’s the little things.